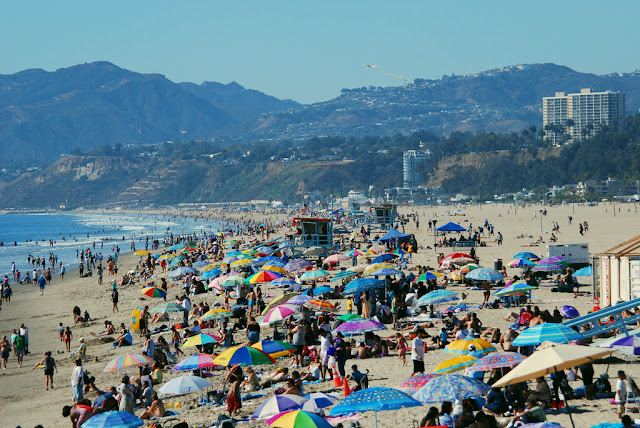 Santa Monica sizzled in triple-digit heat Tuesday as, in a rarity, the beach city felt the pain inland communities have suffered time and again this year from record-breaking heat waves. Abandoned temporarily by the cooling breezes of the Pacific, Santa Monica's temperature reached 101 degrees Tuesday, the National Weather Service reported. According to meteorologists, the temperature broke a record for October 24 in Santa Monica set in 1965, when the mercury reached 98 degrees. Wednesday was expected to be a closer to Monday's 97 degrees -- still not exactly a day at the beach for a city more accustomed to balmy days in the mid-70s temperature range during October. NWS said gusty winds are expected to continue regionally through Wednesday. Tuesday was so hot for Santa Monica that parents of students in the Santa Monica-Malibu public school system were given the option of picking up their youngsters early. "Students who leave early will be provided with an excused absence for the part of the day missed," said Ben Drati, superintendent for the Santa Monica-Malibu Unified School District, which has about 11,000 students in 16 schools. In a notice to parents and caregivers, Drati said SMMUSD is "in the process of creating plans for air conditioning installation throughout our campuses, however, this is a multi-year process. We are addressing this issue with a sense of urgency." "We will be discussing contingency plans for weather-related issues like this to be proactive in the future," he said. Santa Monica Police Lt. Saul Rodriquez said no unusual spike in activity was reported to the department; the fire department also did not list high levels of heat-related incidents on its website. Most of the time, the city by the sea -- like its coastal counterparts -- is spared the broiling temperatures experienced inland during Southern California heat waves. But the mercury showed little mercy anywhere in the region this time around. Torrance topped 102 degrees on Tuesday. Even Catalina Island reached 101 degrees. Downtown Los Angeles registered 104 degrees -- reportedly soaring past the previous record high of 99 degrees set in 1909. Dodger Stadium was still 103 degrees as crowds packed in to watch the first game of the World Series Tuesday evening (which the Dodgers won, 3-1, over the Houston Astros). It was the hottest World Series game ever recorded. "The heat wave and Santa Ana winds are being caused by a large, near-record-strength dome of high pressure that's settled in over the Great Basin, a few hundred miles northeast of Los Angeles," said meteorologist Bob Henson at Weather Underground, a popular online site. "The difference in pressure between this high-pressure system and lower pressure over Southern California has driven gusty northeast winds over Southern California," he said in a post at WU. "Since these originated over desert areas, they are hot and dry. As the air descends from the mountains to the coast, the air gets even hotter," Henson wrote. "These downslope winds are why the most impressive records on Monday occurred along and just inland from the coastline." The weather has been unusually hot throughout the nation this month. An NWS excessive heat warning, originally set to expire at 8 p.m. Tuesday, will now remain in place until 8 p.m. Wednesday in the San Fernando, Santa Clarita and San Gabriel valleys, Los Angeles County mountains, Santa Monica Mountains Recreational Area, the coastal area stretching from downtown Los Angeles and Catalina Island.